Making backup is really important in this era of smartphones. 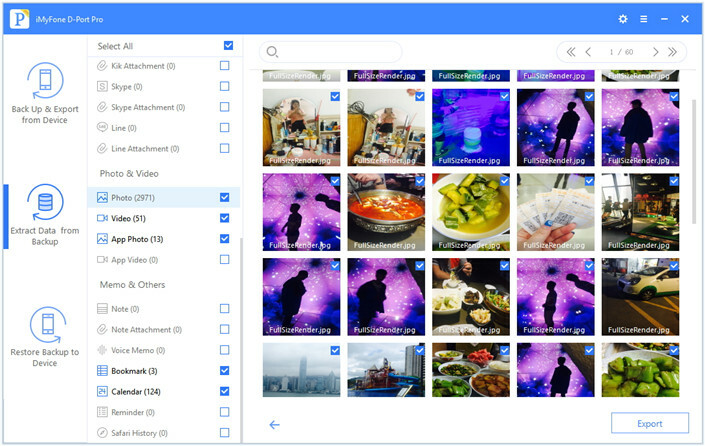 But sometimes, the users only want to backup a particular type of data like messages or WhatsApp messages, and they wish to view the backup on computer. That's iTunes and iCloud cannot do. WhatsApp is used by more and more people, which is why lots of people want to backup WhatsApp messages. Moreover, the latest iPhone (8 and X) has just come out. Thereforewe are going to explain how you can backup only WhatsApp messages on iPhone X/iPhone 8. The most recommended tool to backup only WhatsApp messages on iPhone X/iPhone 8 is iMyFone D-Port Pro iPhone backup and restore tool. 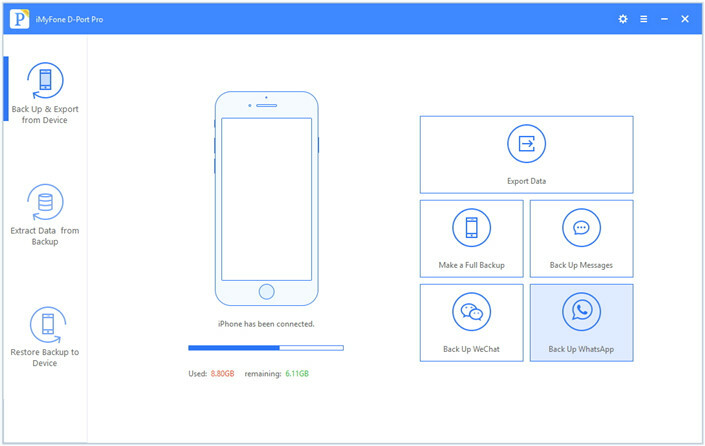 This is a superb backup and restore tool that is able to backup and restore your device in a flexible way. In other words, you can backup messages, WeChat messages, or WhatsApp message separately instead of the whole data on your iPhone X or iPhone 8. 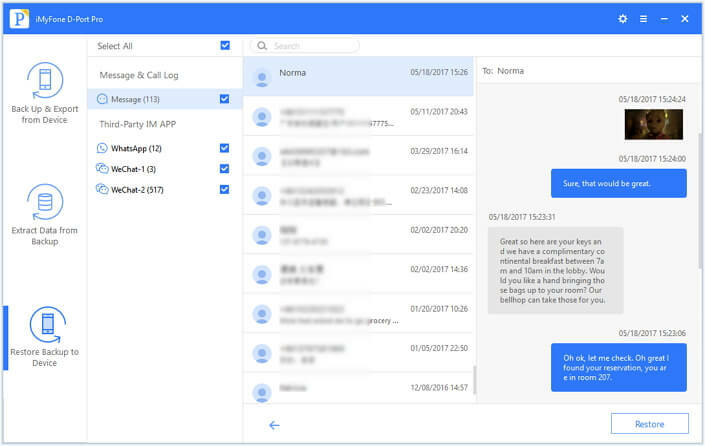 In addition, you can also restore only messages, contacts, WeChat messages or WhatsApp messages to your device. 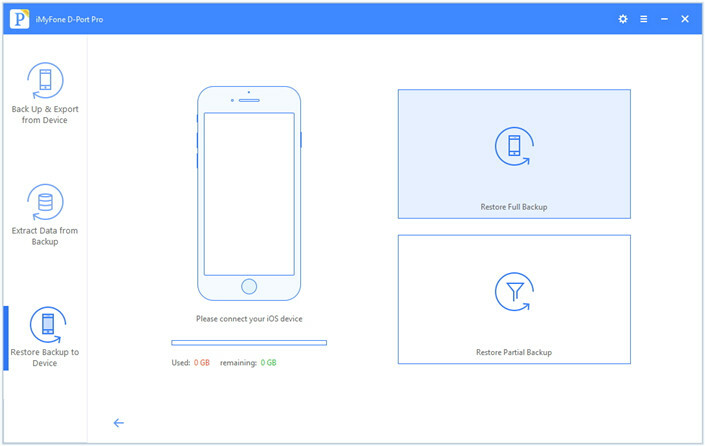 It is now completely compatible with iOS 11.
iMyFone D-Port Pro is very easy to use and you can make numerous backups without overwriting the previous backup files. 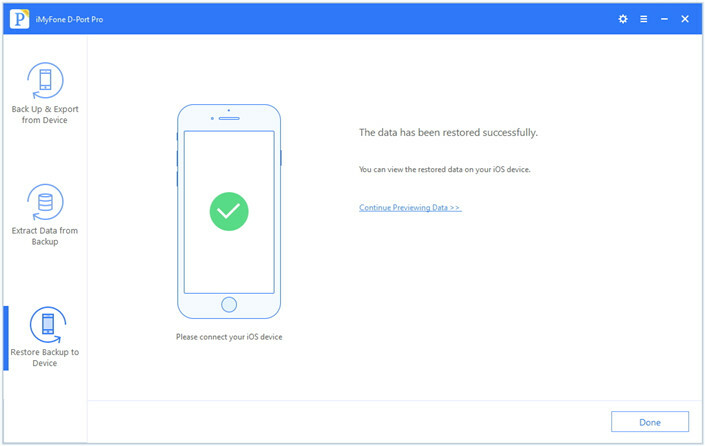 You can selectively restore partial data from any of your backups made by iTunes/iCloud/iMyFone D-Port Pro to your device without overwritting the other data on your device. With this tool, you can also extract more than 20+ types of data from your backup made by iTunes, iCloud or iMyFone D-Port Pro. You can also use it to export data from your iPhone X or iPhone 8. Today, here in this article we are going to demonstrate the tutorial with which you can backup only whatsapp messages on iPhone X/iPhone 8 with great ease. Make sure to install the iMyFone D-Port Pro and plug your iPhone X/iPhone 8 into the computer. Step 1 – Launch the software and click on the tab that says “Back Up & Export from Device”. Now select the data type, i.e. 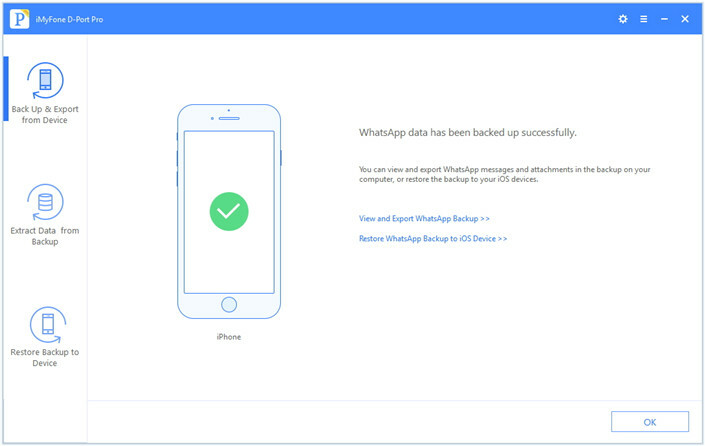 Whatsapp data, you wish to make a backup of by clicking on “Backup WhatsApp”. Step 2 – Now, tap on the “Backup” button and the backup process will then be initiated. Step 3 – Ensure that your device remains connected till the time process completes. On successful completion you will get a notification that your device has been successfully backed up. 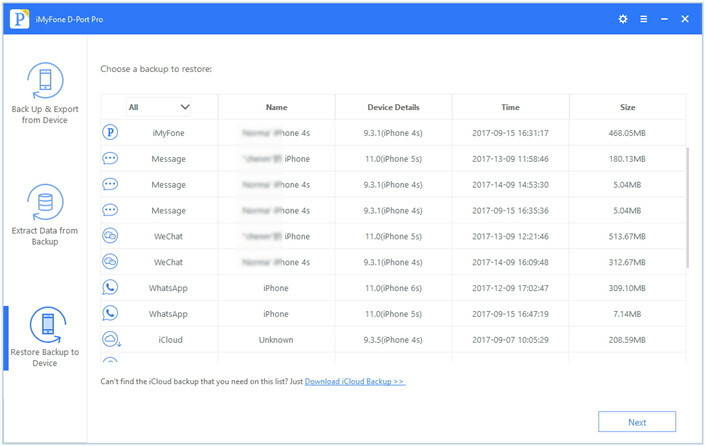 Now that you’ve made backup of only whatsapp messages on iPhone X/iPhone 8 already, you can easily restore the backup back to the iPhone. 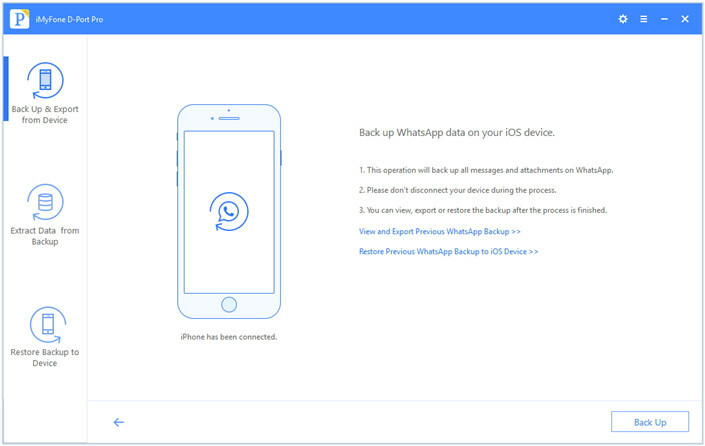 If you has not backed up WhatsApp with iMyFone D-Port Pro before, you can just use the program to merely restore WhatsApp messages from iTunes Backup or iCloud Backup, and the other data on your device will not be affected at all. In this tutorial let’s have a quick understanding of how you can restore only WhatsApp messages to your iPhone X/iPhone 8 out of an iTunes backup file. If you want to choose other backup files, the steps are almost the same. You just need download the iCloud backup if you want to restore WhatsApp messages from the backup. Step 1 – Launch iMyFone D-Port Pro and make sure your iPhone X/iPhone 8 is connected to the computer. Now tap on “Restore Backup to Device” tab and the backup file chart will appears on the screen. Select the preferred backup file and hit “Next”. Now tap on “Restore Partial Backup” as we only want to restore WhatsApp data. Step 2 – You are now required to choose the data types you wish to restore. Select “WhatsApp” in this case and hit “Next” to initiate scanning of the backup file. 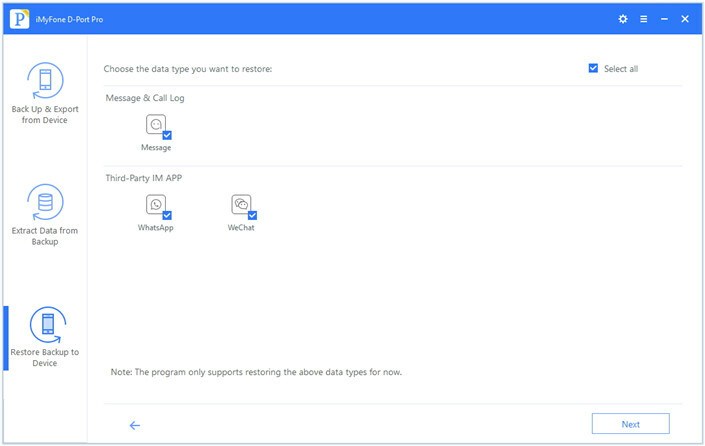 Step 3 – Next, the software provides you the flexibility to preview your Whatsapp data to check if that's what you want or not. Then hit on “Restore” to begin restoring your WhatsApp messages and data to your iPhone 8 or iPhone X. Well this is very interesting, simply because when you’ve made backup with iTunes or iCloud you cannot view your data out of the backup files, you would have to restore the whole backup to the device to view your data. But here is the problem, restoring your device will then overwrite the existing data on your device. Don’t worry, here comes the solution too, iMyFone D-Port Pro has a spectacular feature - allows you to view your data out of your backup files, be it iTunes Backup or iCloud backup or iMyFone backup. Let’s understand how to do it. Step 1 – Open the iMyFone D-Port Pro software on your computer and hit on “Extract Data from Backup”. 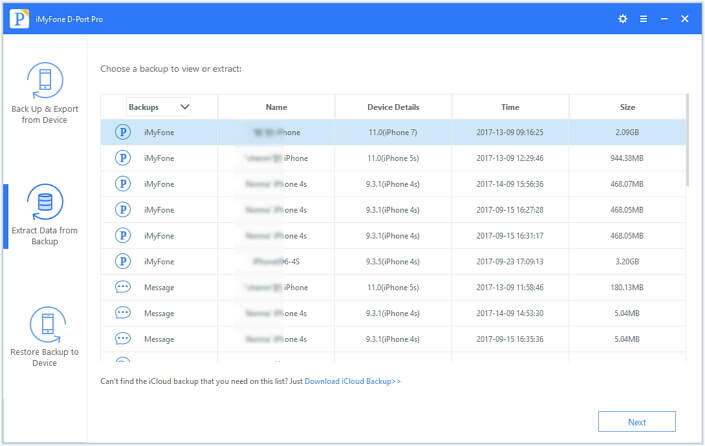 Next, you’ll get to see the backup files listed with their details made with iTunes or iCloud or iMyFone D-Port Pro. Choose one which you wish to transfer and tap on “Next”. Step 2 – It will then start to scan the selected backup file and upon completion you can preview your data on the iMyFone D-Port Pro window. Select the items you wish to view on your computer and then hit “Extract” to export the file to you PC. Step 3 – Within a few minutes, the files will be extracted successfully and you can view them on your PC. Since they say, precaution is always better than cure, so in order to keep your WhatsApp messages safe, you must take a WhatsApp backup regularly. Therefore, we provided you the guide for backup only WhatsApp messages on iPhone X/iPhone 8 so that next time you will not lose them when switching to new device or when uninstalling the app. The other versions of iPhone can also refer to this guide.